Generally, property management costs in Australia range anywhere between 7% and 16%, with all sorts of blends and recipes. The Plus Plus option : this is where there’s a base “management fee percentage” that’s applied to the rent collected…usually 7-10%, PLUS Letting fee PLUS Admin fee PLUS Lease Renewal fees Plus etc etc. These PLUS’s are generally known as “Event fee’s”. Our Flat Fee option is simply a “management fee percentage” that’s applied to the rent collected, with no PLUS’s excepting for when we perform non-property manager tasks, such as attending court and arranging major refurbishments. And possible new services that may become necessary in the future, such as managing debt collection for tenant’s water usage and end of year financial summaries are also charged separately. Our Flat Fee option means you are NOT CHARGED for Letting fees, advertising, lease renewal, inspection fees, or other types of PLUS fees associated with normal day to day property management functions. Since we have introduced our Flat Fee Option most of our Landlord’s prefer this option because it can save them money in fees whilst adding better certainty and clarity. Even though our Flat Fee option is most popular Page & Pearce still offer both fee options to Landlords, as a “one size fits all” approach may not be the best option for you. To compare, see our Excel Spreadsheet Fee Calculator. But it’s not just about the fee. In fact, more often than not, managers that offer low fees are often more costly. – For example, missing a rent review when a lease renewal is due is a huge hidden expense…or having a property being vacant for longer than it need be because the manager does not know how to communicate to the Landlord. To find out more, please call Renee Dunstan on 07 4727 2400, or email: reneed@pagepearce.com.au, or contact us on line for an appraisal. 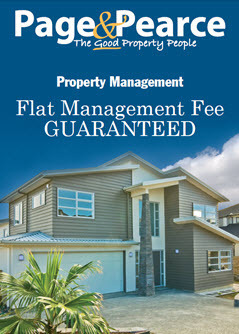 Request a copy of our “Flat Fee Property Management Booklet”.